Growing Myself Back: Happy Thanksgiving! 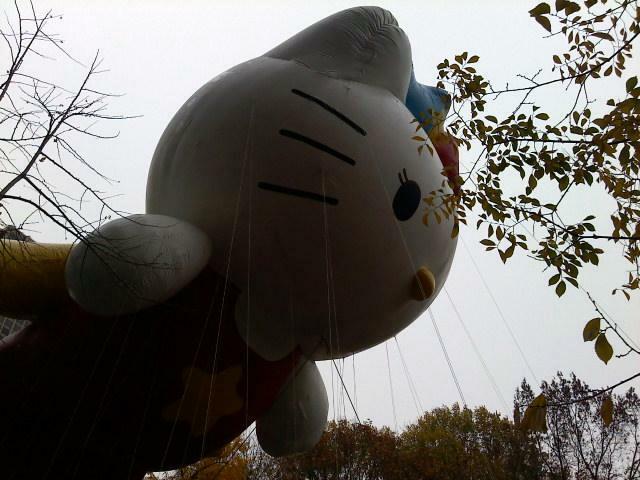 My bestie Marty just texted me a picture of the Hello Kitty balloon seen at the Macy's Thanksgiving Day Parade. I'm not a parade sort of gal, but seeing this in person from the ground certainly would have been worth it. But since I have such awesome friends, I didn't need to be there because when she saw that big old kitty she instantly thought of me. It seems the common thing to do during this holiday is to become reflective about things in your life you are most grateful for. Amazon Prime: The $79 bucks that I paid for this 2-day delivery service is going to save me from all the frustration of holiday shopping in the upcoming weeks. Music: This past week has seen some incredible new releases from some of my favorite artists and right now I can't wait to get in my car and drive with the volume turned up to level 16. Bose: I just accepted a new position within the company as a Retail Analyst. I've begun to meet new people and learn lots of new things about Retail that has me energized and excited to get out of bed every day, not to mention how thrilled I am to have a brand new laptop and shorter commute to work. Spencer: All mushy stuff aside, I am thankful to have spent these past 24 years of my life with him. Cold Nights: Our beagle Minnie is more than happy to snuggle up to us in the bed every night now that the temps have dropped and somehow feeling her weight against the back of my legs or hearing her gentle snoring adds a sense of peace to the night. Friends: My co-worker and friend Patty recently invited me to join her and her family for Hanukkah dinner on December 5th. I know I'll probably be looked upon as a strange invite at the dinner table by some of her family, but the fact that she's welcoming me into her inner sanctum means more to me than I can say. Pomegranates: I look forward to ending each day sitting in front of the TV watching a favorite show and picking those damn little juicy seeds out of their skin and happily eating each seed while I stain the tips of my fingers yellow and try not to make too much of a mess. That's Entertainment: Spencer and I take a trip to this comic book store every Sunday morning. He buys old video games and I buy a couple of Smurfs each week. I love walking through the aisles because it allows me to be exposed to this whole other world of collecting that I've never experienced before. While I see adults talk excitedly about comic books, I get lost in my own world searching for old toys and appreciating the thrill of the hunt. Currently I've got my eye on this Fisher Price xylophone in it's original box, but I talk myself out of buying it every time we go there. I know I'm going to buy it, but just knowing that it remains on the shelf, unsold, week after week will only make it more special to me when I finally give in. So that's my short list of things right now. I hope you take the time to come up with your own list and reflect on what makes you grateful this Thanksgiving.